MSDS для Perceptol и Microdol-X определяет уровень pH рабочего раствора равный 7.8. Sodium Tripolyphosphate в данном рецепте выступает как водоумягчитель и может быть опущен. Мои измерения показали что без него pH раствора получается 7,8...7,9, что совпадает с MSDS. 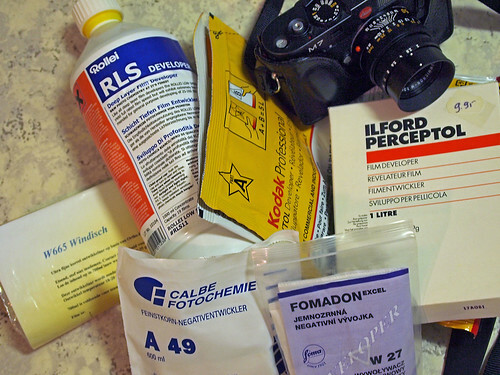 The following formula is from "Improved 35 MM Technique" by Paul Jonas where it is called Competol. It uses sodium chloride to increase the salt concentration and encourage surface development and acutance. Use full strength. The most effective temperature is 27 C. Development times are 6 to 13 minutes. formula and attributes it to Edgar Hyman. Citrate is a cheap chelating agent for calcium. This is to prevent any calcium scum from forming when the developer is diluted with tap water. The dry packaged version of Microdol-X was slightly different in composition but the difference was not meaningful to the user. Sodium hexametaphosphate and boric acid are user instead of the citrate. Do you know what is the effect of the developer when you change the NaCl to KCl with recalculation of the Mol weight? I also think so. The M weight of NaCl = 58,44 g/mol. KCl = 74,55 g/mol so it should be 58,44/74,55 x 30g = 23,5g KCl. Both salts have a big solutibility in water: NaCl 360g/L ; KCl 344g/L so that won't be any problem at all. Time for a test now. I will be back with more results. KCl (pro analyse) is always used in any pH instruments, hence my easy access to this material. The regular NaCl (table salt) for nutrition is not suitable for chemical use. Robert, 30g NaCl/58.44=0.513 mol; 0.513*74.55=38.27g KCl. This is the equal quantity. @HPLC: Thank you very much for the right calculation. I will do the test up from next week in my holidays and show some results. The guy is a danger for the worldpeace. And as usual it is about money and power only. Ps. And I won't say anything about the Boeing 777 who has been shot down with a Russian missile by separatist paid by the Kremlin. It is an act of terrorism and we all know who is responsible for this. Mr Poetin: Hell is too good for you. 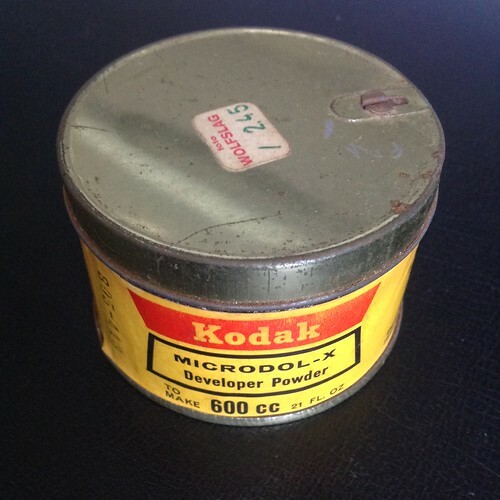 I have made some tests with above receipt (in fact I took the Microdol-X F&L receipt and exchanged the NaCl with KCl) and have compared it with my last package Kodak Microdol-X in a can. This one was already pretty old, a Dutch Florijn price on it: Fl. 2,45 which is about Eur. 1,10. 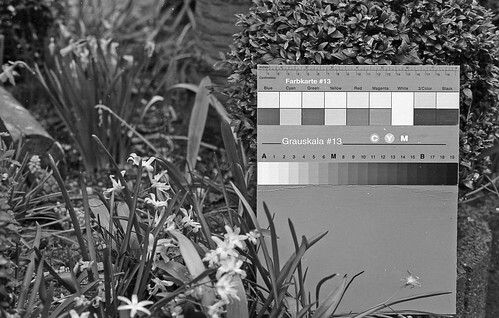 The result: No visible differences and my test films even not in a sensiometric way, the same. That Hans Windisch, W665 developer (a German photographer, photochemist), sold after WWII as Perutz W665 is really remarkable with the Fomapan 200 film on E.I. 100. It reacts in the same way as Harvey's 777 but the W665 is containing ortho- Phenylene Diamine while 777 has para- Phenylene Diamine in it. Officially you should "rippening" these developers when starting with a halve piece of junk film. FP200 E.I. 100 in W665 1+0 for 9:45 minutes at 20C. The Grey card is exactly 0,72 logD on my TRDZ (Heiland) densitometer.